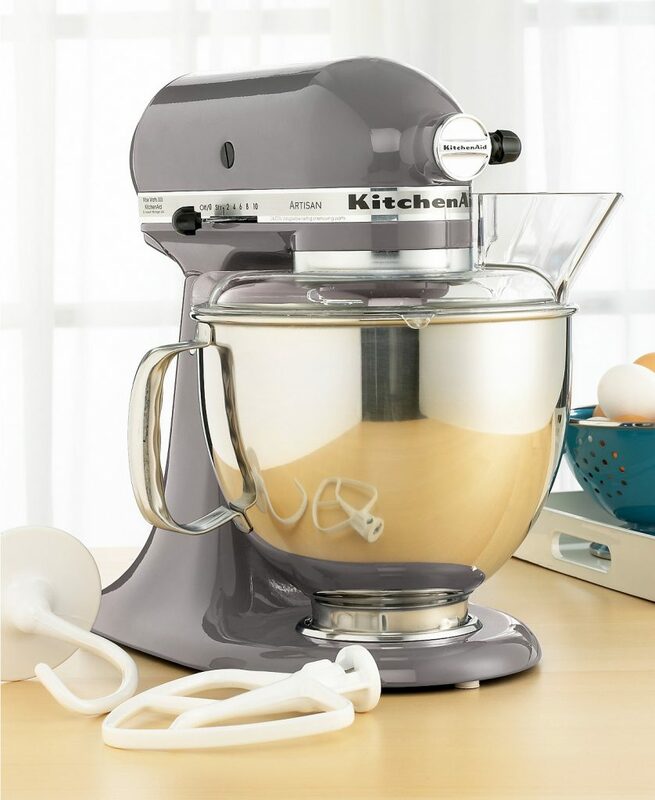 Were you sad because you missed last weekend’s epic online only KitchenAid sale? Well, Macy’s must have heard you complaining to your girlfriends or seen your Facebook rants because today there is an even bigger and better KitchenAid stand mixer on sale! You heard me: the KitchenAid KSM150PSSM Artisan 5 Qt. Stand Mixer is over 50% off TODAY. Retro styled and easy to use, the KitchenAid Artisan stand mixer is the perfect kitchen companion. Employing a unique tilting head to facilitate bowl and content removal, this mixer is undeniably handy. It also comes with a 1-year hassle-free replacement warranty. In addition to the stand mixer itself, the low price includes a flat beater, wire whip, dough hook, pouring shield and 5-qt. polished bowl with ergonomic handles. Take note, because when I bought my new KitchenAid stand mixer last year, it took me a long time to find one that came with both the pouring shield AND the bowl with handles (my first stand mixer didn’t have the handles, and it always made handling it more difficult once I removed it from the stand). Plus, after one Christmas of making cookie dough, I knew I needed the bigger 5-qt. bowl, not to mention the pouring shield to keep flour from flying everywhere in my kitchen. This is a limited-time special that ends on August 20 and doesn’t require any additional promo code to be entered. As far as I can tell, the silver metallic color is the only one included in this particular sale, but luckily, it fits into almost every kitchen scheme.